This is our most popular circuit through Morocco. Offering insight into its modern imperial cities, ancient history, beautiful Sahara landscapes, and hidden desert oasis. For the first time Morocco traveler, there may be no better introduction to this fascinating country. Casablanca is Morocco's most forward-minded city. It is where modern industry is churning most noticeably, and where Morocco's economy shows the most activity. 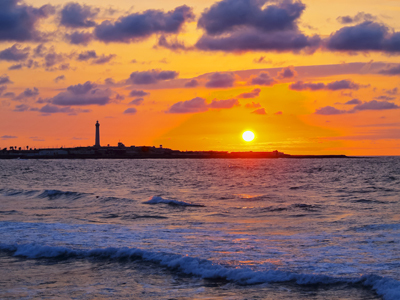 Commonly used as Morocco's gateway, most international flights arrive and depart from here. Despite most travelers wanting to reach the Sahara or walk in Marrakesh's medina, Casablanca deserves a little more attention. It is where a culture as old as Morocco's gazes onto a modern world, and interprets modern fashions as its own. Much can be learned about Morocco's culture by walking its streets and meeting its people. Today, you will be taken to Fez, one of Morocco's impressive Imperial Cities. Along the way you can stop in Meknes, one of Morocco's lesser-visited Imperial Cities. Located here is one of Morocco's most impressive gateways, Bab Mansour. Thirty minutes away from Meknes are the Roman Ruins of Volubilis and the sacred town of Moulay Idriss, which sits perched overlooking the ruins. You'll arrive to Fez in the later afternoon. An old and noble city, Fez truly is the center of culture and intellectualism in Morocco. 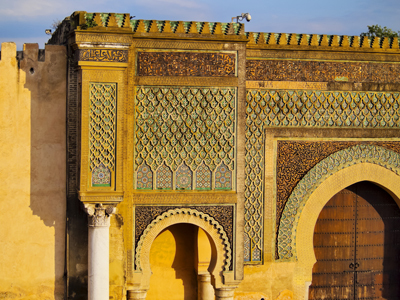 Many of the country's most important historical movements began in Fez, and although the city has seen ruler after ruler come and go, it has stood strong for over 1,200 years. The rich history is apparent everywhere you look, as you navigate through the medina's narrow passages. Wind your way through the city and wake up your senses with the flavors and aromas behind every street corner. Money from tourism has poured into Fez in the past couple of decades, influencing the construction of more modern riads, to compliment an ancient lifestyle. 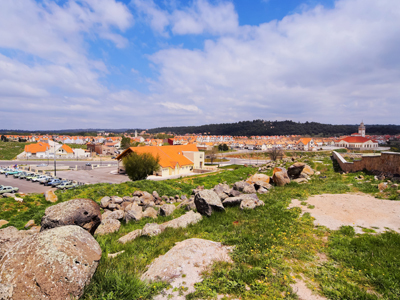 You will depart early this morning and head to Ifrane, the gateway into the Middle Atlas Mountains. From this alpine area, you'll continue onward through Midelt and into Tafilalet, a region that includes the expansive Ziz Valley oasis. It's here where you'll meet our local coordinator who will take you on a short walking tour through this rich agricultural area filled with date palms and small farmsteads. Following, lunch will be served at his family's humble home. After a relaxing night in the hotel, you'll be fully rested for tomorrow's desert adventure. This morning you'll have some time to relax (or to explore Erfoud and Rissani) before continuing south to Merzouga and the Erg Chebbi region of the Sahara Desert. Once near the dunes, you'll take a 4x4 to meet the camels where a one-hour ride on these local dromedaries takes you into the encampment. If you'd rather not ride camels, you can continue into the desert camp via 4x4. You'll be sleeping in a Bedouin-style tent. This tent area has actual beds/blankets/sheets, carpets aligning the ground, and western-style bathroom facilities. A scrumptious dinner will be served this evening. The limitless expanses of the Sahara feels like a final frontier. As one of the world's most sparsely populated regions, the Sahara Desert provides unspoiled beauty in the void of life. This dramatic destination showcases some of Morroco's most memorable and iconic experiences. Spend an evening in a Berber-style camp, sleep beneath a blanket of stars, admire epic sunrises & sunsets and explore the endless sea of powder sand dunes by camel back. These unparalleled activities promise an experience that cannot be replicated anywhere else in the world. You'll rise with the sunset to grab some photos before taking a 4x4 (or your favorite camel) out of the dunes. If you'd like to do a bit of exploring before heading out, you can head to the now touristy village of Khemlia to listen to Gnawa spiritual music. Once in Tinjedad, you'll be able to make a stop at a local Berber-history museum that also serves excellent lunches. Here, we can arrange a guided walk of this lesser-visited palm oasis if you'd like. En route to Skoura, if you'd like to visit the Dades or Todra Gorge (Todra being a bit more touristy), either one will add at least two hours to your transport time today. We do not recommend this in the cooler months with shorter days. You'll end today in the scenic Valley of Kasbahs on the edge of Skoura. Once at this kasbah guesthouse, you'll have time to relax and enjoy the garden before dinner is served. Although Skoura is not usually considered a major highlight of Morocco, this quaint town is slowly, but surely working its way to become quite the desired destination. Located in the province of Ouarzazate, Skoura is the perfect stopping point between the vast sand dunes of the Sahara Desert and the staggering cliffs of the High Atlas Mountains, en route to Marrakesh. Although it is small, this charming town features beautiful scenery and a seldom experienced glimpse into the lives of local Moroccan people. 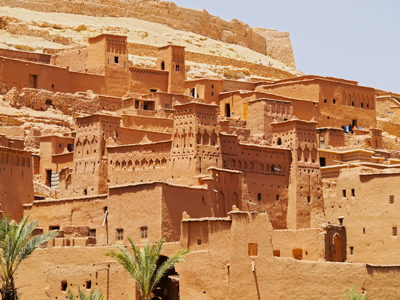 After leaving the palm oasis valley this morning, you can visit Ouarzazate. This relatively new city is home to the Taorirt Kasbah once owned by the Glaouis family, who ruled Morocco. You will also be stopping at the UNESCO world heritage site at Ait Ben Haddou which several famed films have used as a backdrop. One highly recommended (and off-the-beaten-path) location you might also consider stopping at is Telouet. This impressive kasbah was once the stronghold of the Glaoui family as they ruled the entire southern region of Morocco. Choosing this option will add one hour of transport to today's total. Following, you'll head over the Tiz n Tichka pass, which winds over the High Atlas Mountains and to Marrakesh. 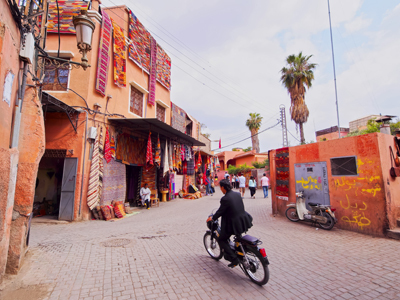 Marrakesh represents the maze of shops, entertaining street performers, exotic foreign spices and hard working street vendors, that Morocco is known for. Marrakesh welcomes the quintessential Moroccan travel experience. Each of the imperial cities have their own medinas, but there is a reason that foreigners know about the Marrakesh Medina best. Where berber tribes once traded their gold and ivory, vendors now sell trinkets to tourists, in a world where the atmosphere has remained the same for centuries. The churning of commerce is thriving more than ever, and the result is quite magical. Today, you can do any last minute shopping or sightseeing before heading to Casablanca at your convenience. Located in the heart of Casablanca, this old private mansion was built in the 30's by an Italian contractor. The legend tells that is was built as a gift to his wife, whom he met in Morocco. Nestled in the city center, the hotel is shrouded in the peaceful Art Deco district of Casablanca. This jewel of a hotel has witnessed the ups and downs of Casablanca, and remained proud throughout. It was recently renovated to preserve the authenticity and to safeguard the architecture. 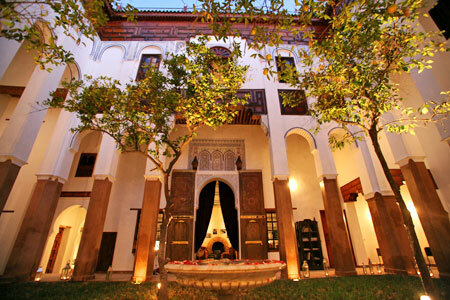 The Riad Laaroussa- Guest House is a beautiful 4-star accommodation located in the town of Fès, in northern Morocco. Housed within a former 17th century palace that has been renovated by area craftsmen, this hotel features high ceilings, arched doorways, lovely traditional décor, and beautifully detailed tile work. After a long day of travel, you can unwind to the sounds of water fountains on the patio beneath the shade of orange trees. Later, get scrubbed down with traditional black soap in the hammam then get a massage with jasmine or orange flower oil amidst candles, aromatherapy, and soothing music. When you get hungry, dine on delicious Fassi cuisine on the patio or the terrace, which offers an amazing view, or in winter next to the cozy fireplace. Kasbah Hotel Xaluca is located in Erfoud, a city known as “the Door to the Desert”. 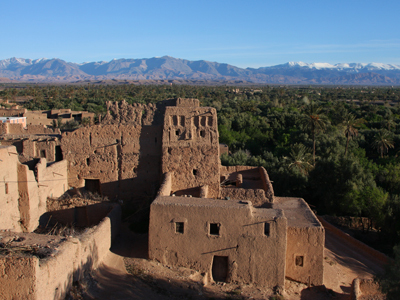 This beautiful Kasbah is especially unique, due to its distinctive characteristics and antique charm. The property was built with adobes, the traditional Moroccan building bricks and invites you into a pleasant space to relax and unwind among the dunes and palms. Xaluca Erfoud features 8 bungalows and 134 spacious rooms decorated with regional materials. The hotel combines tradition with modern amenities, where installations are adapted to the highest standards. The Desert Camp Bouchedor offers visitors the chance to escape the crowds of the cities and get away from the outside world, to enjoy a magical experience. 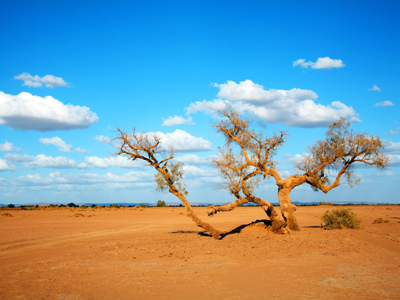 Located in the desert of Erg Chebbi, it is a unique destination, where you can enjoy tranquility, beauty and the famous Berber hospitality. The camp blends traditional Berber design with modern comforts. There are eight luxurious tents, each one spacious and comfortable. In addition, inside the camp is a large restaurant tent, serving Moroccan culinary specialties and a traditional Berber tent, where you can relax and enjoy your unique surroundings. At night, you can savor an unforgettable evening filled with traditional Berber music under a spectacular star-filled night sky. Dramatic sunrises and sunsets are another unmissable experience to enjoy as part of your desert getaway. Les Jardins de Skoura is nestled within the wonders of the Skoura palm grove, renowned for its many kasbahs. Surrounded by a magnificent lush garden that houses a number of different trees and fragrances, stand five spacious and air-conditioned bedrooms and three suites. During the beautiful summer time, you are invited to kick back and relax on one of the terraces, lay by the poolside under the olive trees, or take a stroll through the colorful vegetable gardens. On crisp winter nights, the lively dining room is warmed up by the atmosphere of a chimney fire. The restaurant features refined Moroccan and Mediterranean specialties. Les Jardins de Skoura perfectly combines a true Moroccan countryside experience, with all the necessary comforts and luxuries. Riad Siwan is a stylish and beautifully renovated riad down an unprepossessing alley near Djemaa El Fna. The Dutch owners Cees and Maryk have not just given this former ruin new life, but have put a serious sense of style into every element from the stunning lighting to the individual beds and bathrooms. Ornately-carved columns tower over the plant-filled courtyard, while the rooftop has amazing views and plenty of space to soak up the sun, while at mezzanine level there is a discreet narrow plunge pool. There are seven spacious suites, each individually designed with a flourish of fabrics and bold design, and a wonderful dining room which makes you want to dine in for the stylish interiors alone. The riad can also arrange massages on request. This is just one of many authentic travel experiences offered by Global Basecamps. If you are interested in more unique destinations to Morocco with unprecedented planning and extraordinary service visit our main Morocco tours page to browse other sample trips.